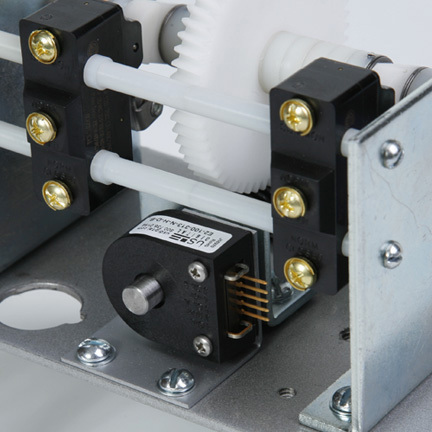 •The Model LS-1 LogiStop® is a programmable multiple stop limit switch that can provide 2 to 20 preset stops on virtually any type of rotating machinery. The LogiStop's® optical encoder is provided as part of a complete rotary limit assembly which also includes two mechanical limit switches to serve as over-travel sensors. 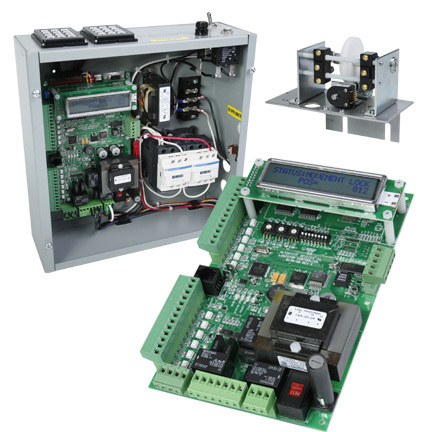 The LogiStop® control component is provided in a NEMA 1 control box which includes an LCD display for monitoring instruction steps, factory numbered keypads to program the unit, a power-lost LED indicator, fuse protection for the control circuit, and DMX &RS422 input ports. Programming a limit stop involves simply jogging the machine to the desired location, pushing the "ENTR" key and then pushing the key number you want to assign to this position. The next time you need multiple-stops to meet project specifications, consider using the Model LS-1 LogiStop®. • Easy 3 step programming – jog to the desired position, press the PROG/ENTR key, then the number to be assigned to the current position. • Onboard LCD display - displays items such as: current instruction, current count value, board state, diagnostic messages, etc. • Optically isolated low voltage control inputs. • Non-volatile memory – programmed positions are stored in EPROM memory, which retains it memory even if power is lost. • Form C output relays for connection to standard contactors, DC Drive boards or AC Inverter drives. • Form C Brake relay for operation of external friction brake. • DIP switch settings for enabling or disabling Power Loss lockout, DMX control, Remote Control Programming, Auto-zero on limit activation and acceptance of full 513 byte packets only. • Mechanical rotary over-travel limit switches. 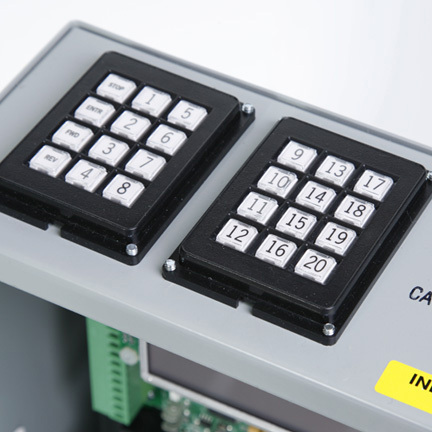 • Keypads for local programming and control (cannot be removed from control box). • DMX compatible – the new LS-1 is now capable of being directly connected to any DMX512 network. • The LS-1 has terminal strip connections for D+, D-, Shield, SP+ and SP- so the DMX network conductors can be wired directly to the board without the need for special connectors or plugs. • The LS-1 also has a built in Termination Resistor for the DMX network. 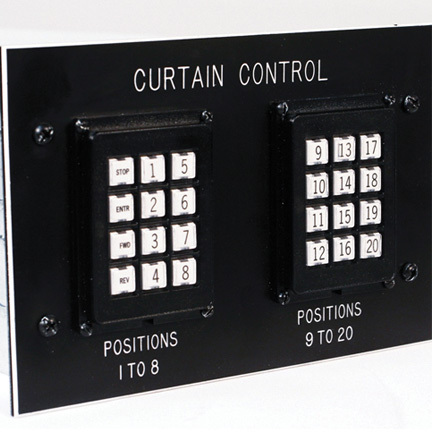 • Base address for the DMX network is set via on board rotary digital switches. Each stop position requires one DMX channel. • The LS-1 program includes protection from unintended movement if channels are left high when others are taken low. 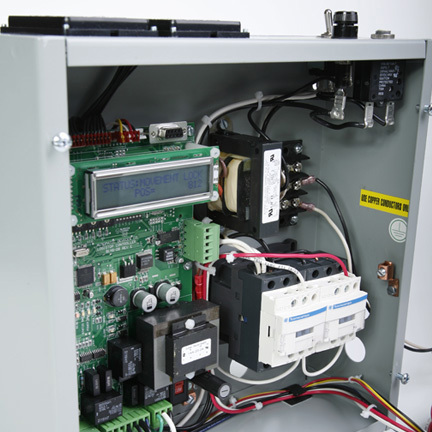 • The LS-1 can be programmed and operated by an RS232 network and Terminal Emulation software. • The LS-1 is provided with an on board standard 9-pin RS232 port. • Information such as: current instruction, current location, count value, etc are transmitted back through the RS232 port and can be displayed on the terminal connected to the port as well as the LS-1 onboard display. • The RS232 connection also allows the user to set a Dimension Value (DIMF) which is based on the size of the output drum, spool or sprocket, and allows actual footage values instead of count values to be displayed. • The LS-1 can be operated via any type of normally open, momentary operation pushbutton or contact set. • Connections to the pushbutton or contact operators are via onboard removable, screw type terminal strip connectors. • All contacts share a single signal or common conductor. Each function then requires a single additional connection. • All functions may be addressed via the pushbutton or contact connections. • Control voltage is 12 VDC and it is a Class 2 circuit. • All inputs are optically isolated. • Anywhere from 2 to 20 input pushbuttons or contact sets can be used to address 2 to 20 stop positions. • Optional RCSLS-1 remote control station allows you to preset stops & cues as well as program functions into the LogiStop®. • Custom remote control stations are available. Contact the factory for additional information.